A solar eclipse was recorded by the Assyrians in a "text" on a clay tablet that has been used to fix the chronology of Mesopotamian history. In June 1752, Benjamin Franklin is said to have flown a kite in a thunderstorm to prove that lightning is electricity. Franklin charged a Leyden jar by touching it to a key that was suspended from the kite's string. The kite was not struck by lightning as some accounts report, an event that would almost certainly have killed him. Instead, Franklin noticed that the strands of the kite string were starting to stand out (due to the accumulated static charge) and touched the key with the Leyden jar, proving his point. Jean-Francois Pilatre de Rozier, co-pilot of the first manned flight (1783), and his companion, Pierre Romain, became the first casualties of an air crash when their hot air balloon exploded during their attempt to cross the English Channel. Charles Goodyear received US patent number 3633 for the vulcanization of rubber. C. H. F. Peters discovered asteroid #88 Thisbe. The first attempt at motion pictures, using 12 cameras each taking one picture, was done to see if all four of a horse's hooves leave the ground in a gallop. Leland Stanford bet they didn't. He lost. Professor E. E. Barnard first observed a large white spot on Saturn while searching for details that could be used to determine its rotational period. John Alcock and Arthur Brown completed the first nonstop transatlantic flight, landing at Clifden, County Galway, Ireland. B. Jekhovsky discovered asteroid #1093 Freda. C. Jackson discovered asteroids #1278 Kenya and #1279 Uganda. C. Jackson discovered asteroid #1324 Knysna; and K. Reinmuth discovered asteroid #1322 Coppernicus. C. Jackson discovered asteroid #1676 Kariba. Miguel Itzigsohn discovered asteroid #1581 Abanderada, #1582 Martir and #1779 Parana. 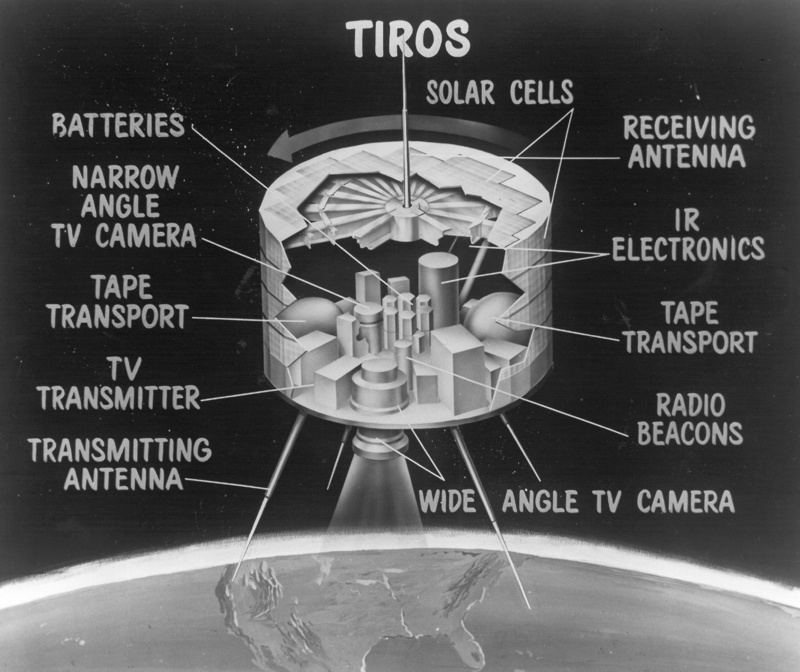 NASA's TIROS 1 (Television and InfraRed Observation Satellite), the first weather satellite, ceased transmissions due to an electrical failure. The Saturn C-1 first stage successfully completed its first series of static tests at the Marshall Space Flight Center with a 122 second firing of all eight H-1 engines. USSR conducted the first iron test stand firing of the 11D56 liquid hydrogen/LOX engine for the N1M. This was the first USSR test of an engine powered by these propellants for use in a space launch vehicle. NASA and the US Air Force launched X-15A HS/Stab/WTR Test/Technology mission # 182 which reached a maximum speed of 5803 kph (Mach 5.14), and a maximum altitude of 69.891 km. NASA Explorer 49 (RAE-B) was inserted into Lunar orbit in preparation for its radio astronomy mission. USSR launched Cosmos 573 from Baikonur in a successful test flight to verify safety modifications to the Soyuz 7K-T breathing ventilation valve, probably using one of the spacecraft allocated to the failed Salyut 2 or Cosmos 557 stations. USSR issued a decree authorizing development of the 11B97 nuclear electric rocket stage. USSR issued a decree 'On course of work on nuclear rocket engines' on 15 June 1976. The 11B97 stage would have an electric capacity of 500-600 kW and would use specialized plasma-ion electric engines using standing plasma waves and anodes. It was to be powered from a reactor with a 200 litre core containing 30 kg of uranium fuel. In 1978, this engine was also studied for use as a reusable interorbital space tug for launch by Energia-Buran. USSR launched Soyuz 29 from Baikonur to Salyut 6 with cosmonauts V. V. Kovalenko and A. S. Ivanchenkov aboard for a 139 day stay, to conduct scientific and technological investigations and experiments. In the first space shuttle solid rocket booster (SRB) qualification test firing, at Thiokol, Utah, the motor burned for 122 seconds, the nozzle extension was severed at end of the run as in an actual mission, and the gimbals were fully cycled. USSR Soyuz 32 landed, returning Lyakhov and Ryumin from their stay at Salyut 6. The USSR Vega 2 descent craft landed on the surface of Venus after releasing a balloon aerostat during its descent through the atmosphere. The first test flight of the Ariane 4 launcher, from Kourou, carried the Meteosat 3 weather and Panamsat 1 commercial communications satellites to geostationary orbit, and the AMSAT-OSCAR 13 amateur radio satellite into a 37995x809 km orbit. The Intelsat 709 communications satellite was launched from Kourou, and positioned in geosynchronous orbit at 50 deg W in 1996-1999. As of 4 September 2001, it was at 49.96 deg W, drifting at 0.015 deg W per day. The Galaxy 3C communications satellite was launched on a Zenit-3SL booster from the Odyssey sea launch platform off Kiritimati (Christmas Island) in the Pacific Ocean. The Galaxy 3C launch was delayed from July 2001 and 28 May, 2 June, and 9 June 2002. The satellite was launched 15 June 2002 from the Odyssey floating launch platform at its standard equatorial location at 154W 0N. The Zenit second stage and the DM third stage with payload entered a -2160 x 195 km suborbital trajectory at 2248:10. At about 2252 UTC the DM stage entered a 180 x 393 km x 0 deg parking orbit. A second burn of the DM at 2324 to 2330 UTC put Galaxy 3C in a 358 x 41440 km x 0.02 deg transfer orbit. This was a record low inclination for a geostationary transfer orbit. The satellite's R-4D apogee engine was to put the Boeing BSS-702 satellite in geostationary orbit. The satellite was the first 702 model to use extra solar panels instead of the solar concentrators which ran into fogging problems on the earlier 702 flights.